This shows how to transfer/move/upload music, pictures and videos between your Android device and a Mac. 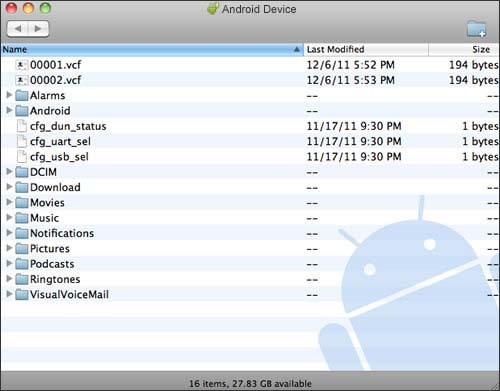 Android File Transfer is an app for Macintosh computers (running Mac OS X 10.5 or later) used to view and transfer files between a Macintosh and an Android device (running Android 3.0 or later). For assistance downloading and installing the Android File Transfer app, refer to Android Support Article: Android File Transfer. For additional information on the Android File Transfer app, refer to to Google Mobile Support Article: Connecting to a Macintosh computer via USB. From the Macintosh desktop navigate Finder > Applications > Android File Transfer. If using Android File Transfer for the first time, double-click it to open it. After starting Android File Transfer once, it opens automatically whenever the device is connected to the computer. From the Home screen of your Android device, swipe down on the Status bar (at the top of the display). Selected File Transfer then tap Just Once or OK. If prompted, select Get Started. The Android File Transfer window opens, displaying the contents of the device. One or more files can be dragged from the computer to a folder within the Android File Transfer window. File sizes can be up to 4GB. One or more files can be dragged from the Android File Transfer window to the computer. From the Android File Transfer window, click the New Folder icon. Located in the top-right corner of the window. Enter the desired name for the folder then press Enter. Select one or more files or folders from the Android File Transfer window. From the top menu, navigate File > Delete.